Heard about 600 Second Saga? In between current writing projects, I'm always on the lookout for new venues to share my fiction, particularly stories that haven't been in the spotlight lately. The Submission Grinder is a great site for finding publications that accept new work as well as reprints. Whilst perusing the listings a week or so ago, I stumbled upon 600 Second Saga, a science fiction & fantasy podcast. Every week, they feature authors and "their vision of the fantastic, futuristic, and far-fetched. 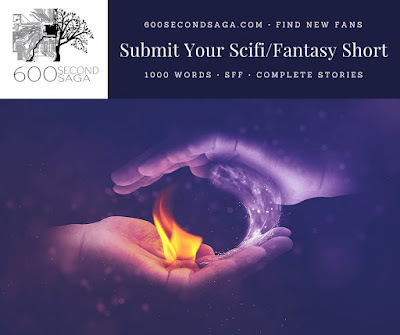 Each tale is an escape in less than ten minutes to a world of epic fantasy, cyberpunk, shifters, aliens, magic, and more. Authors include established and new talent from around the world." Episodes are released every Wednesday and can be accessed via their website in addition to iTunes, Google Play, and YouTube. I sent them my story "Tomorrow's Dawn" (Trapped in a lunar tube with an alien terrorist doesn't allow much hope for the future -- or does it? ), originally published by Daily Science Fiction, and received an acceptance letter the same day. The audio version will be available in a couple weeks, so stay tuned! Want to submit your own story? Check out the guidelines here. Want to hear some of the other stories on 600 Second Saga? Have a listen here.